It is a Dutch review for the APHND show in Dynamo, Eindhoven (Netherlands). Awesome show. Matt Brown is touring with Schecter Guitars! (2) APHND Guitars on the left and (2) Seventh Void Guitars on the Right. Since I'm usually behind the scenes here at APHND, I just wanted to take a minute to wish everyone a happy new year and happy holidays, whatever you celebrate or don't celebrate for that matter. Even with some of the tragedies this year, it has been amazing. Thank you all for being such awesome an supportive fans of APHND and this is just the beginning of our APHND family! Well, the "AND HELL WILL FOLLOW ME" album is in!!! I ordered on Friday and received the cd on Tuesday already. Not bad from the US of A to the Technocratic Republic of Europe, new speed record. Here is a review I made. It will certainly interest nobody cause it's in french and I don't think there is lots of frenches here (am I the only one ?) but never mind. Check out the Hit The Pit Blog. Great & positive review of the new album "And Hell Will Follow Me". In the blog appears the news that Sal and Matt signed a record deal and that it will be announcing soon (?) I'm curious which record company is offering the best deal. Any records company hearing the album must feel it in their balls that this is pure gold. Write to AMC Walking Dead and tell them to put APHND on their next episode.I did! Now it's up to you! Have you been watching The Walking Dead on AMC? What do you think? 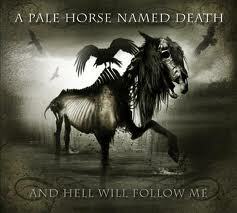 Shouldn't A Pale Horse Named Death have some music on the show? We think so!